The 2015 Nissan Xterra maintains the Xterra’s iconic design and fun, ready-for-adventure attitude! Tackle the rough terrain inside a comfortable cabin with a 5.0-inch color display, Bluetooth with Mobile Apps and, SiriusXM satellite radio! Regardless if you decide to drive your 2015 Xterra around the city, or if you feel like getting a little dirty on the back roads, the 2015 Nissan Xterra has got the performance and handling to take on any ground! Find your next adventure starting at Carriage Nissan, your Gainesville Nissan dealer! The 2015 Nissan Xterra has a powerful 4.0L DOHC 24-valve V6 engine generating 261 horsepower and 281 lb-ft of torque. That is enough power to climb mountains, explore the backwoods, and dive deep into some mud and get out with ease! The 2015 Xterra achieves approximately 22 mpg highway and 16 mpg city*. With unlimited cargo potential inside and out, you will love life inside a 2015 Nissan Xterra. Everyone knows an Xterra when they see one driving by. Its iconic styling is one that has maintained its popularity through the years. 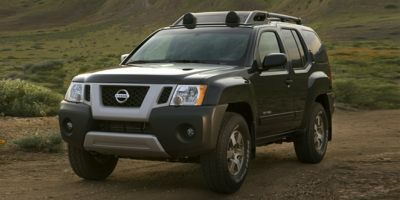 Some of our favorite standard exterior features on the 2015 Nissan Xterra are the 16-inch steel wheels, the tubular roof rack with air dam that sets the Xterra apart from any other SUV on the road, and the hyper silver aluminum/black front bumper. The rear bumper steps are super convenient when taking down cargo on the roof, and the black inner headlight color, UV-reducing solar glass, and the rear privacy glass all add to the element of appeal. Learn to live life on the edge, or at least make it appear that you do, with the 2015 Xterra. The exterior of the 2015 Nissan Xterra may be born for adventure, but the interior is strictly for comfort! Some standard interior features include: Bluetooth® hands-free phone system, remote keyless entry, a retained accessory power and battery saver, under-floor area cargo storage, AM/FM/CD audio system with 6 speakers and an auxiliary audio input jack, and illuminated steering wheel-mounted audio controls. Want more? Some higher trim level features include: NissanConnect? with Mobile Apps, SiriusXM® Satellite Radio with 3-month trial subscription, Utili-track® Cargo Channel System with four adjustable cleats, and a Rockford Fosgate®-powered AM/FM/CD audio system with 9 high-performance speakers and an 8-inch subwoofer. There’s a lot to risk when exploring the unexplored! The 2015 Nissan Xterra was built to keep you safe. The premium standard safety features include: Nissan Advanced Air Bag system with dual-stage supplemental front air bags with seat-belt and occupant classification sensors, driver and front-passenger seat-mounted side-impact supplemental air bags, roof-mounted curtain side-impact supplemental air bags for front- and rear-seat outboard occupant head protection, Vehicle Dynamic Control (VDC) with Traction Control System (TCS), Active Brake Limited Slip (ABLS), LATCH System, and a Tire Pressure Monitoring System (TPMS). Be sure to stop into Carriage Nissan and take the 2015 Nissan Xterra for a spin today! With our large inventory, our team here at Carriage Nissan loves helping our customers find the perfect new car or used car for them! Please feel free to contact us if you have any questions or would like to schedule a test drive!